Invite booth staff members by following these simple steps to let your colleagues start gathering leads at the event. Once you have purchased the Lead Retrieval by Attendify, inviting booth staff is an easy and simple process. Also, you can invite as many members as you need, this is covered by one lead retrieval license. 2. Fill in the email address and name of the invitee. Then click "Invite"
To resend or delete the invitation just click the ellipsis button next to the profile. After the invitation is sent, the staff member will receive an invitation email with instructions on how to proceed. Owner - is the person who originally purchased the Leads app. Owner's profile can't be deleted and the rights can't be transferred to any other user. 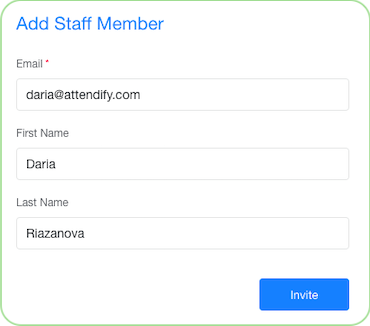 Admin - has the rights to invite other staff members, assign Roles, see and manage all the leads scanned by all Staff members. Member - can see only the leads scanned by them. For more info on how you can use the Lead Retrieval solution please visit this page.